If an employee already has a profile on GoCo and they come back to work, you should rehire their original file for your records. To rehire an employee, you will first go to your Team page. You can access this on your left menu in GoCo or from the Company page. From here, click on the Filter button to the left of the search bar and click on Terminated. This will include those employees in your search. After you locate the employee you want to rehire, click on their card to open their GoCo profile. On their Personal Information section you’ll notice an Actions button. If you click on this, you’ll be presented with several options. You may choose to rehire them as either Employee or Contractor. Either selection will retain some information gathered by GoCo from their original file. 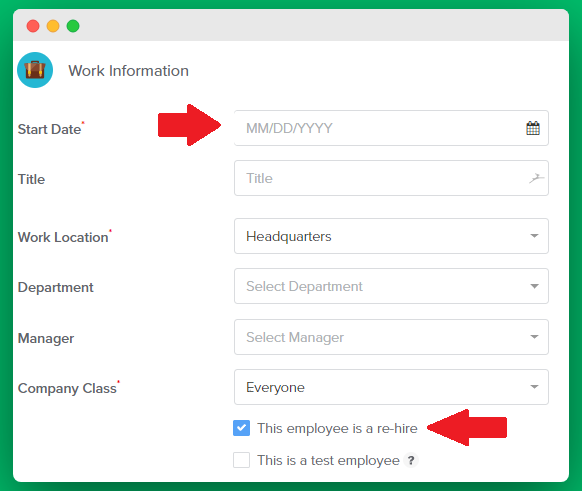 Fill in the new Start Date and make sure the “This employee is a rehire” box is marked off as you complete this process (it should be by default). Continue your normal new hire process, including any salary updates and reissuing an offer letter. 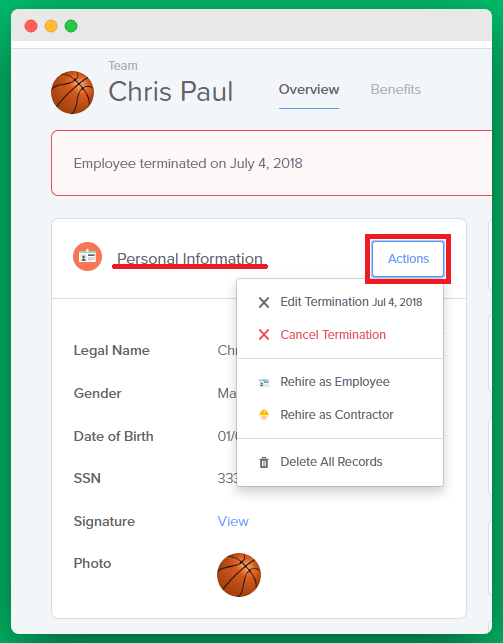 You will notice that the employee should have both a terminated file and a new, active employee profile on your team page. You're all set! Once the employee gets their new onboarding link, they will be asked to re-onboard with GoCo. The good news is that it saves all of their personal information from their old profile and gives them a chance to make changes or leave it as is. If the new profile you created has the same personal email on file (it will by default) they can use the password they've already created. If you change their email, GoCo will ask them to create a new password.